This one's from the Garlic Farm Cookbook. 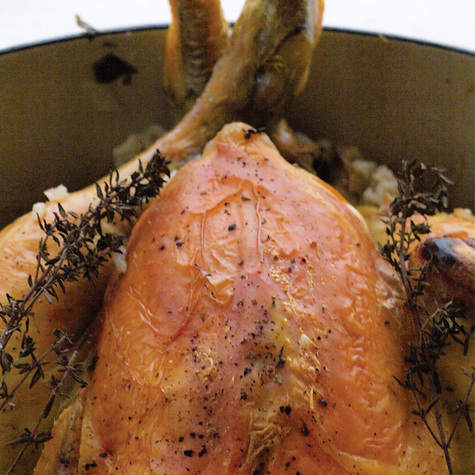 The classic chicken with 40 cloves never fails to please. This is a slight variation which makes an entire meal in one pot. Of course, you can use as many cloves as you want so don't hold back. Do make sure you get a good quality free range chicken. This is a brilliant one pot rustic dinner party dish, full of flavour and nutrition. Pour rice into a large casserole and stir in parsley, onions, carrots, bacon and lemon zest. Place the chicken on top and pour over the garlic, thyme and bay leaves. Season well. Squeeze the lemons on top of the chicken and pop the skins in to the cavity of the chicken. Pour the wine over the rice and add enough water to cover the rice by 2cm. Cover and place low in the oven for 1 ½ hours then remove the lid for the last half hour to brown the chicken and garlic.